Thrivemovement – What Did These Dead Healers Know? At least 13 holistic doctors have recently been reported missing or dead, though none were known to have any life-threatening health condition. Are these deaths linked and could there be a larger agenda at hand? Take a moment to review critical information recently uncovered by Foster, detailed here in his latest blog. 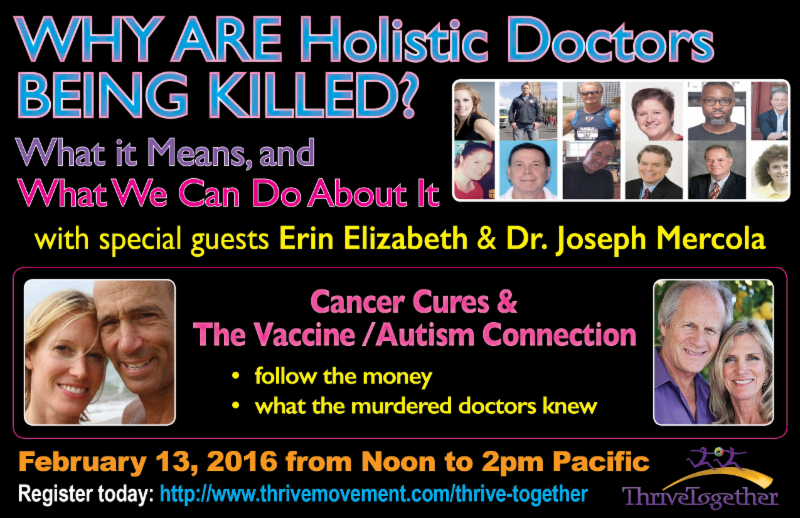 Join us in the ThriveTogether think tank on February 13th, 2016 for our next live event, where our special guests and alternative health proponents, Erin Elizabeth and Dr. Joseph Mercola, will join Foster and Kimberly to dive deeper into what the murdered holistic doctors knew, the links between them, and what we can do about it. As always, be sure to bring your insights and questions. Find out more HERE.